Out in the Philly area, Straub’s beers aren’t that easy to find. You may have heard of it, and maybe think of it as a “Rolling Rock” sort of light lager, with no distinctive attributes – or a smaller Yuengling from out in the middle of Pennsylvania somewhere. Some of you may even have heard about it being in a town called “St.Marys”, and something there called the “Eternal Tap”. I recall reading about it years ago in Lew Bryson’s great “Breweries of Pennsylvania” guidebook. In it I read about the “Eternal Tap” and imagined it as some sort of ancient beer fountain inside some turreted German gothic beer hall. Due to circumstance and some paying work nearbye (relatively speaking) I found my way through the small refinery towns of central Pa to St.Marys – and the Straub Brewery up on the hill. They turn out a very respectable 41,000 barrels a year of just three brands – Straub, Straub Light and Peter Straub’s Dark. That makes them larger than say Bear Republic, Anderson Valley or Troegs, but smaller than Victory (about 58K) and much smaller than similarly German rooted Spoetzl – makers of Shiner Bock- who are 10 times as big as Straub’s. So what is there to notice about them? Well, other than the fact they have been turning out “all grain” fresh (and bottle pasteurized) lagers from about the same location since 1872, not too much that would excite a craft beer appreciator – unless you are real old school. I mean OLD. But, the brewery tour was delightful, and though it was about 10am on a Friday morning – a group of about 7 of us were ready for the brief tour. After a little history and explanations of the bottling line, the guide asked us “who wants a beer right off the line?”. 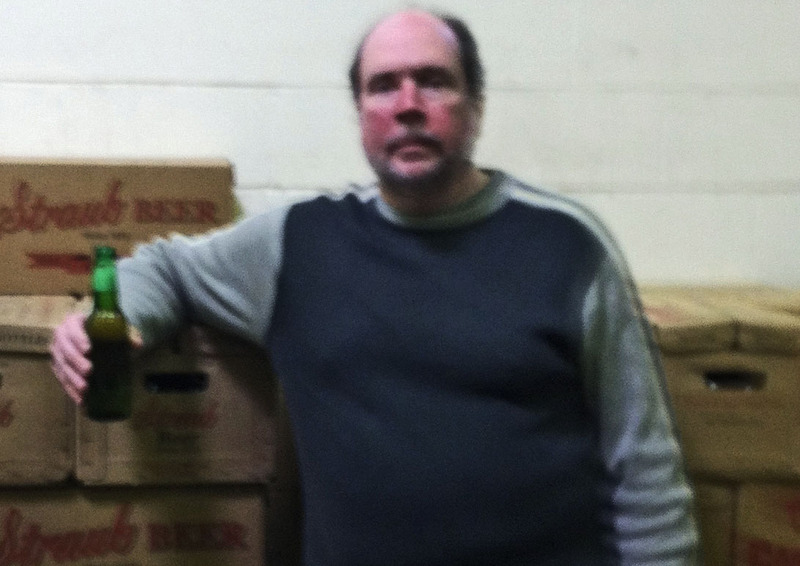 A few of us raised our hands and were rewarded with green, unlabeled uncapped cold lagers. Hey, I’ve had much worse beers for breakfast. Why the green bottles for only some of the beer? “Once back in the 70’s the supplier ran out of brown bottles, and the green bottled Straub’s (affectionately called “Greenie’s”) sold better, so we kept them.” This was the major innovation of the last few decades. But, hey, that’s OK, cause it is what it is, and the locals can drive up to the window in the front of the brewery and have cases brought to their car window (or trunk). Try that at Sierra Nevada and see what happens! What about the “Eternal Tap”? 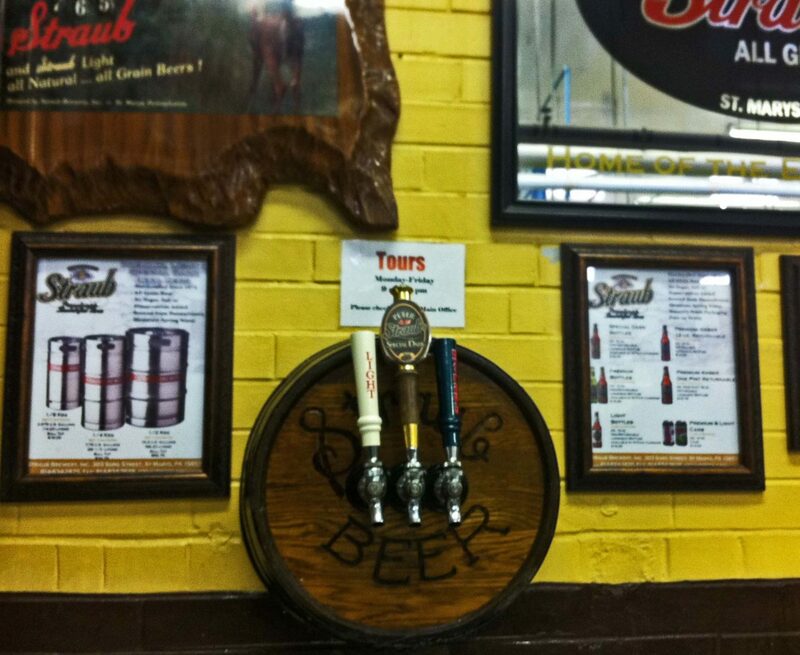 Well, it’s a keg with three taps – all three styles, and a rack of plastic cups – just help yourself. It’s been there for a very long time, and they don’t plan on changing it soon (though the old tin cups are gone). And that’s the way they like it in St.Marys – advertising is local and features wildlife that really are animals, and while they freely admit using cornflakes in their mash – it’s all grain and “honest” as it can be. 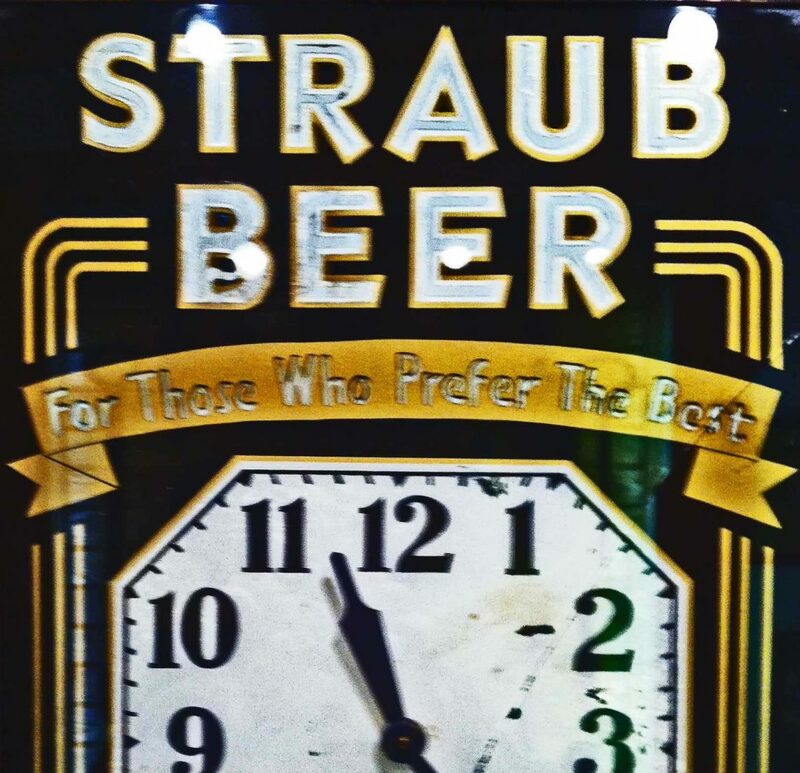 If you find yourself toolling across the state on Route 80 with some time to kill, you will find an enjoyable, friendly, old school beer experience at Straub’s.